Awe, I so appreciate the way so many of you welcomed me back on Monday. You know a bloggers only reward, outside of their enjoyment of writing, is in the comments she/he receives and I so appreciate it when you take the time to leave me a comment. I know how busy all of our lives are and taking just that two or three minutes is a real gift to me. This time tomorrow I will be on an airplane headed to Des Moines, Iowa. Yep, not the best time of year to be headed that direction but sometimes you gotta do what you gotta do. My one and only and my favorite nephew has the leading role in his college's spring play. And, that play just happens to be Godspell and his leading role is Jesus. He attends Northwestern College in Orange City, Iowa. I am beside myself with excitement! 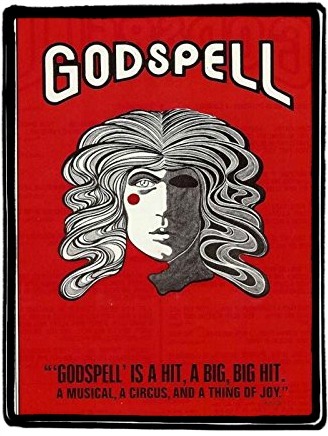 Godspell hit Broadway in 1971 and that was definitely during "my day." Many of you may well remember it too and I can remember singing Day by Day forever. My brother and his wife live in DesMoines and I will be staying with them and enjoying some visiting time and then we will head towards Orange City Saturday morning so we can attend the matinee performance. Warren has been in every play the college has had since he started his Freshman year and no doubt, he'll be in all of the rest until he graduates in 2018. 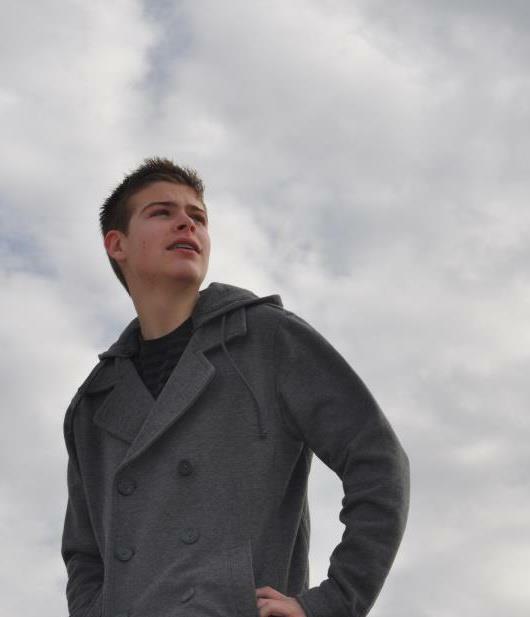 He is a multi-talented young man and I am so excited to see where the Lord leads him. Changing the subject........Fellow bloggers, 2-3 months ago I began noticing that some elements on my blog design were missing. I was missing my Facebook and Pinterest icon, my Google Friend Connect, and my "share" button at the end of my blog. I had no idea what had happened so I contacted my blog designer and ask her about it. She asked me which search engine I used and I told her Firefox. She told me to check and see if the elements were missing on Internet Explorer. I did and they were not. Everything was just as it should be. Now, I have no idea why it is that way but thought that many of you may have experienced the same thing if you use Firefox. 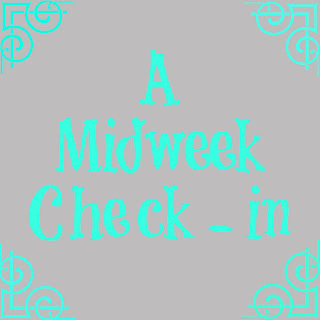 Have a good rest of the week and I'll have a post up shortly after I get home. Surprise! Surprise! Yep, I'm back, all renewed and refreshed. 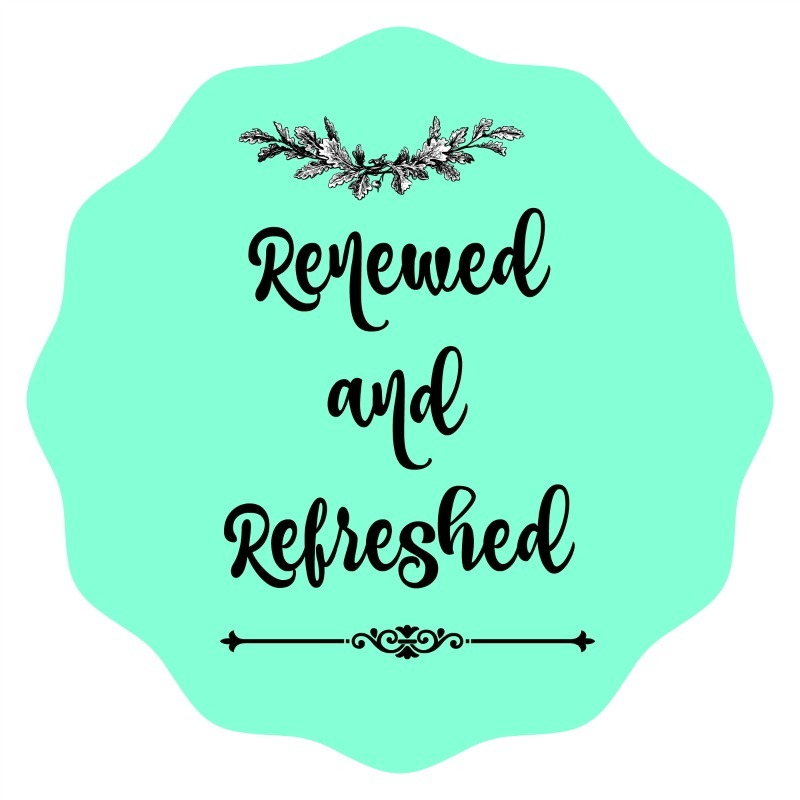 It didn't take long for me to realize just how much I missed blogging. It's only been 2 weeks since my last blog but it feels like it has been a month. If I had been gone or super busy then I'm sure it wouldn't have felt near so long, but I just simply could not wait until the first of March to get back to what I enjoy. 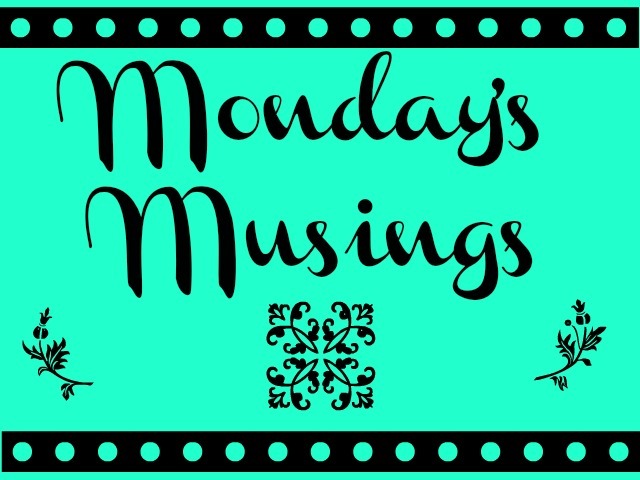 I'm not sure anything will really change with my blog postings but perhaps I'll go to two posts a week, maybe I'll stick with three, shucks, I may even throw in an occasional Tuesday or Thursday post. But, I'm just going to roll with it and continue to enjoy it. Our precious little Sweetheart turned a year old. Is she not the sassiest! This is just one of her one year portraits and I promise you that everyone of them were fantastic. Her Mom was hoping for just one good one and she got more than she could handle and now is having difficulty choosing from them. ~what a nice problem to have~ She smiles all the time and those blue eyes speak to you. She is an attention grabber for sure. And, the Princess lost one of her front teeth and was beside herself with excitement. I had forgotten that losing your first teeth is quite a milestone in the eyes of a child. And, what can I say about this? Our little butterball with his big brother. Coleman may have gotten off to a slow start but that little fella has made up for it. Look at those fat rolls. I can't wait to squeeze him in about 3 weeks. 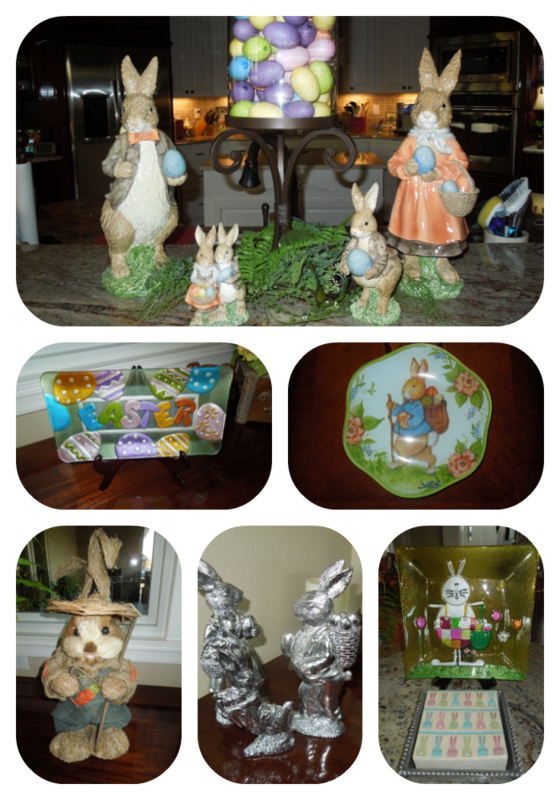 I could hardly wait to get out my Easter decorations and place them throughout the house. Easter is my very favorite holiday and I'm sure that's because it falls very near to or in the Spring. And, I love bunnies in any shape, form or fashion! 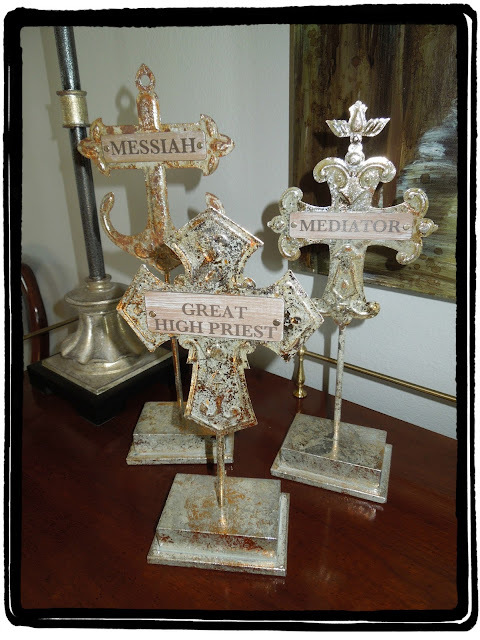 I found these lovely crosses on stands right after Easter last year and got them to use on the sideboard in our dining room. They portray the real meaning of Easter beautifully. Phase 1 of many phases have begun as we begin the process of landscaping. Hubby decided he wanted the inside of the circle drive to be completely sodded and the remainder of the yard will be seeded. 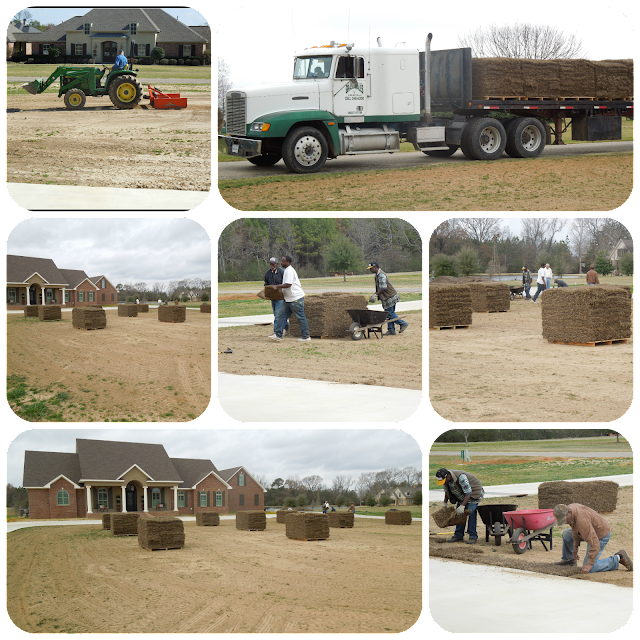 The yard was leveled and prepared earlier last week, the grass delivered on Sat. morning and the guys went to work laying it out. Did I mention that it is hard, hard work, back breaking kind of work as far as I'm concerned. But, these guys made it look like it wasn't that big of a deal. It will look so much better when it greens up. ~ugly dead grass~ Stay tuned for the next phase. 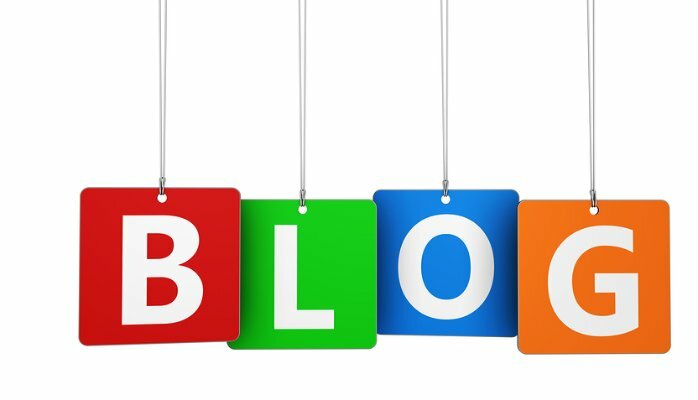 Okay, readers, here's the deal..........I've been pondering my blog for quite some time and am just not sure what direction I am about to take. For those of you who are not bloggers, blogging takes quite a bit of time, some posts more than others. 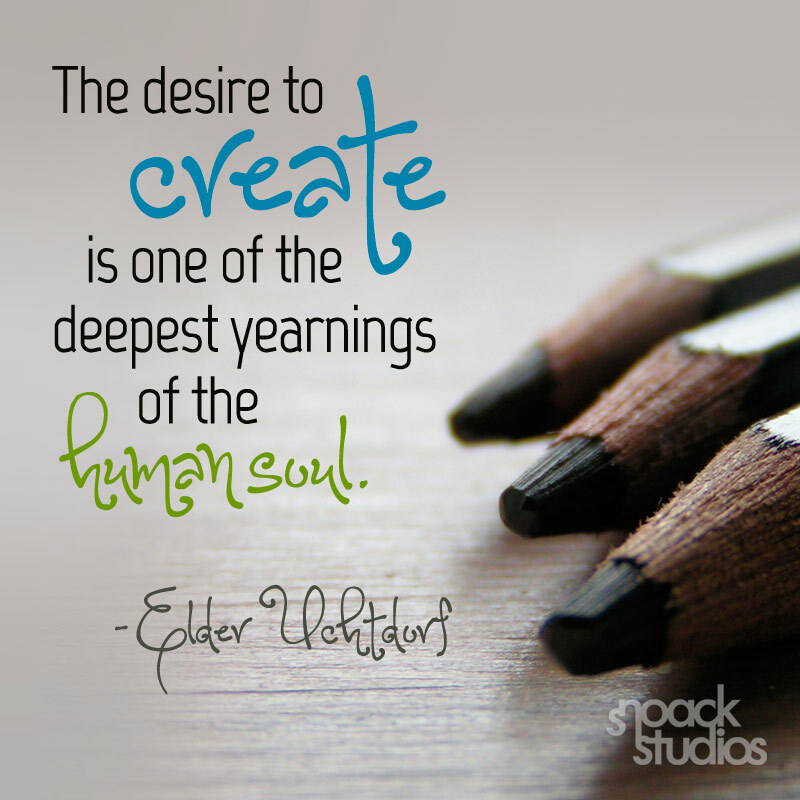 There is content to produce, and pictures to edit for use and that can be very time consuming. I began blogging 7 1/2 years ago and it has been one of the most enjoyable things things of this nature that I have ever done. I've learned so much in these 7 1/2 years and I'm a person that just cannot do something halfway. It's either all or none! By that I mean, I've always tried to be a consistent blogger because I think that is what readers enjoy and it's what I enjoy. 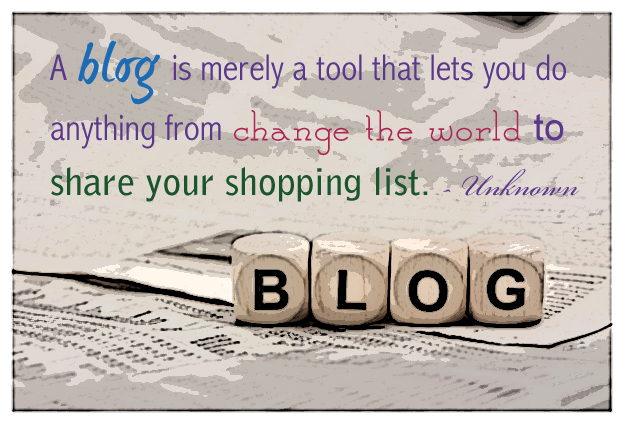 My favorite bloggers are those that blog with consistency and don't just fade away for weeks or months at a time. 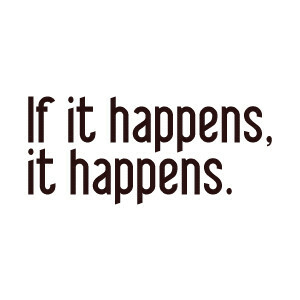 I'm just not a "if it happens, it happens" sort of gal. Now, I might be better off with my blog if I were. It seems if I am not working on a blog post then I'm thinking about a blog post. I'm constantly on the lookout for blog worthy pictures and then edit them and get them ready to put on my blog. 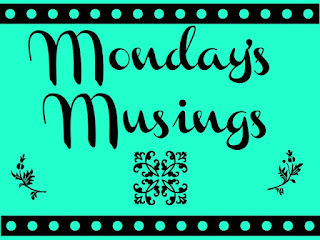 I'm beginning to feel that my blog is a bit overwhelming and I do not do well when I feel overwhelmed in any area of my life. So, what do I do???? Do I quit something that I'm deeply passionate about or do I rethink the way I'm doing it and set up a new consistency routine? I want to master my blog, not my blog master me and I'm afraid that's sort of how I feel right now. So, I'm pondering what is best for me and my time. I want to be a good steward of my time and plain and simple, I feel that I am devoting too much time to my blog. As I stated previously, I'm an "all or none" sort of gal and I'm not sure that cutting back to less posts, perhaps 1 a week would work for me. But, it may be what I try before just throwing in the towel on 7 1/2 years of investment. I am blessed to have a great audience of non-bloggers that read my blog and when they compliment my blog it is like "icing on a cake" for me. 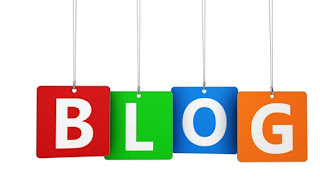 I want my blog to be enjoyed by all who take the time to stop by. And, of course, I try to be a faithful reader of other blogs, especially those that have become my "blogland" friends. And, guess what, that takes time as well. And, yes, I am at a stage in my life that I have quite a bit of time but again, I want to be a wise user of the time given me. And, not that reading other blogs is wasting time, it is not, it's just that I am afraid that I probably spend too much time doing that as well. So, here I am, thinking, pondering, praying and hoping to come up with an answer to my dilemma soon. And, just so you know, this is a very small issue in the big scheme of life for sure. But, it's a big part of my life and I want to do what will be best for me and the use of my time. Perhaps I am overthinking the entire situation and need to just "go with the flow." Blog whenever my heart desires, don't fret over it and just let it happen. Sounds simple enough. 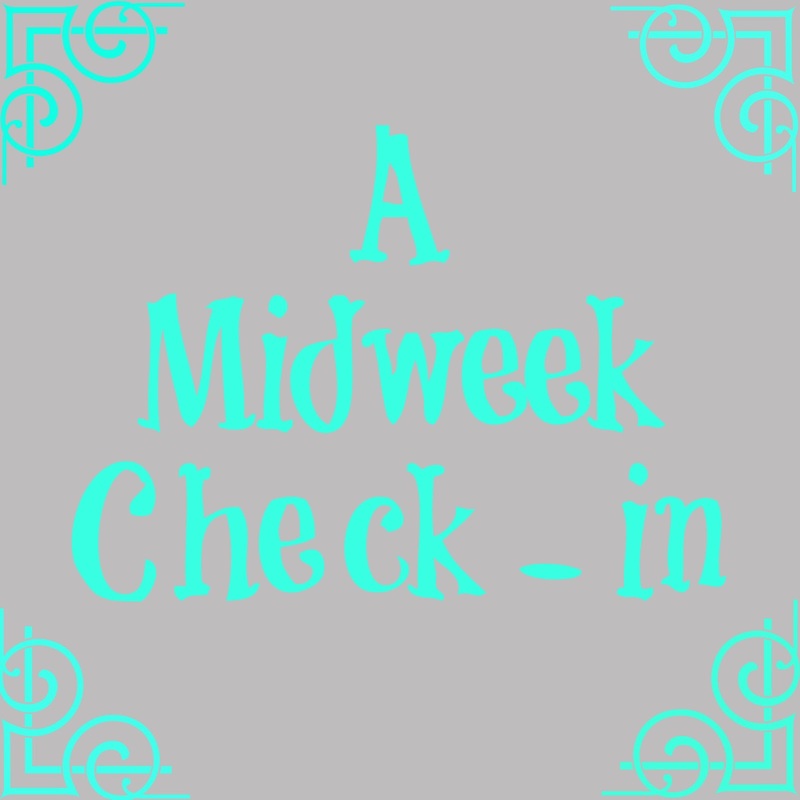 But, for now, I'm just going to step away from my blog for a couple of weeks and see how I feel and I will return to let you know what I have decided around the first of March. I feel I owe that to you, my faithful readers. It has always aggravated me terribly when a blogger that I've been following for some time just suddenly disappears, never to be heard of again and I never know what happened. So, I'll return with my decision and in the meantime, know that I love and appreciate you all! We have been enjoying some of the most gorgeous weather the past few days and looks like the week ahead is promising more beautiful days. The mornings are rather nippy but it warms up so nicely by noon and it brings thoughts of Spring to my mind. I am so ready and I do realize that we are still a few weeks out, but it doesn't stop me from looking forward to it. There's something so refreshing about Spring! We have been what you would call settled in our new house for about 3-4 months but I continue to add little touches here and there. Some I haven't really even thought about until I was out and saw something that I thought would look nice in a particular place. Such was the case with the bird prints. I was flipping through a catalog and saw these and I immediately thought of a wall where they could probably find a nice home. And, I was right! 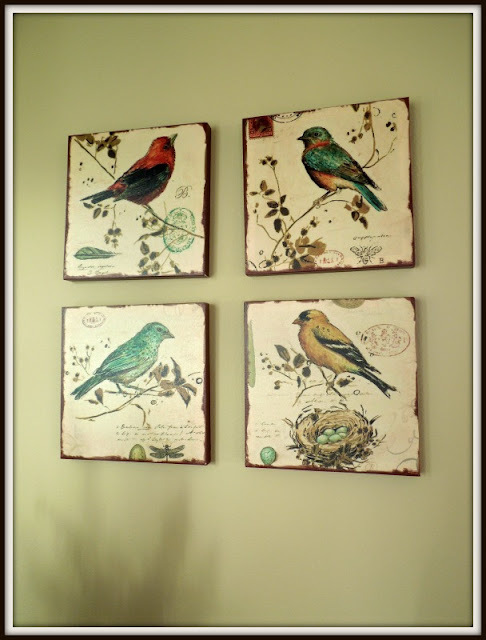 They are a stretch canvas and I have always had a "thing" about birds and the I love the pop of color they add to the room. In our old house this armoire almost came to the ceiling so there was no room to add anything to the top of it for height. But, in this house, it's a different story. As I lived with it for about 4 months with nothing on the top I felt as though it looked very empty and lonely. 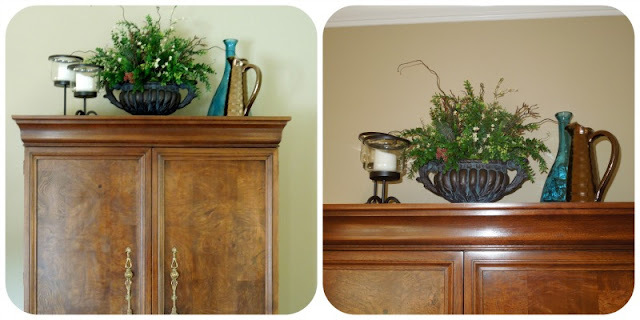 I began looking and came across these accent items and think they were the perfect "icing on the cake" for this piece. At first I only had the floral piece and it really looked lost by itself. I found the other pieces at TJ Maxx and they were the perfect addition to finish it off. 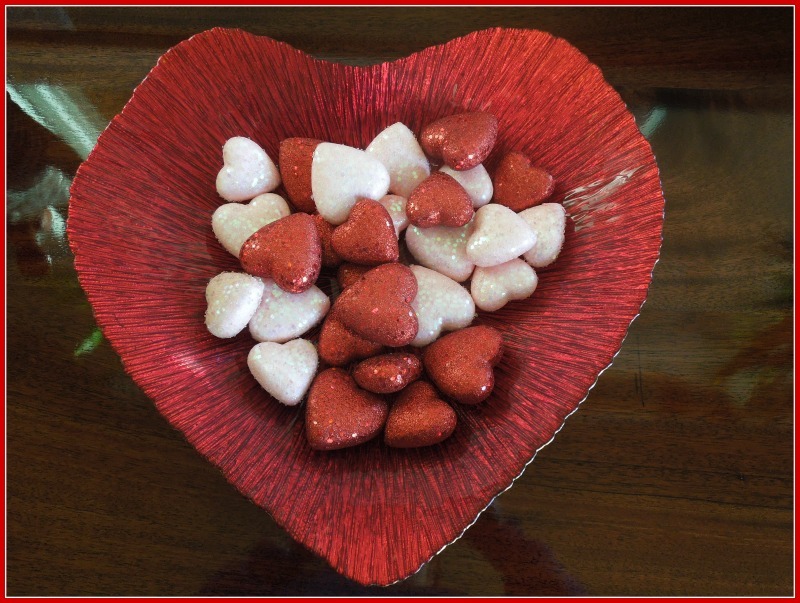 And, on our recent trip to Oklahoma my daughter took me to Marshall's and they had this gorgeous heart shaped bowl and it beckoned until me. ~chuckle~ I found the glitter hearts at Wal-Mart and it made the perfect seasonal piece. It is a big piece and was $12.99. I love TJ Maxx, Marshall's and Tuesday Morning. They always have the best deals on home decor. With the gorgeous weather it has caused Hubby and I to start working on the back porch. This Saturday we went shopping for new cushions for furniture, an outdoor rug and a new grill. I loved the bright colors of these cushions and since they will not be exposed to the sun they should stay bright for a while. We got a plain woven outdoor rug as we felt the colors in the cushions were enough color without adding anymore in the rug. I did get a colorful entrance rug for the door going in the house from the porch. I love the big pineapple in the center and think it definitely has a welcoming feel to it. 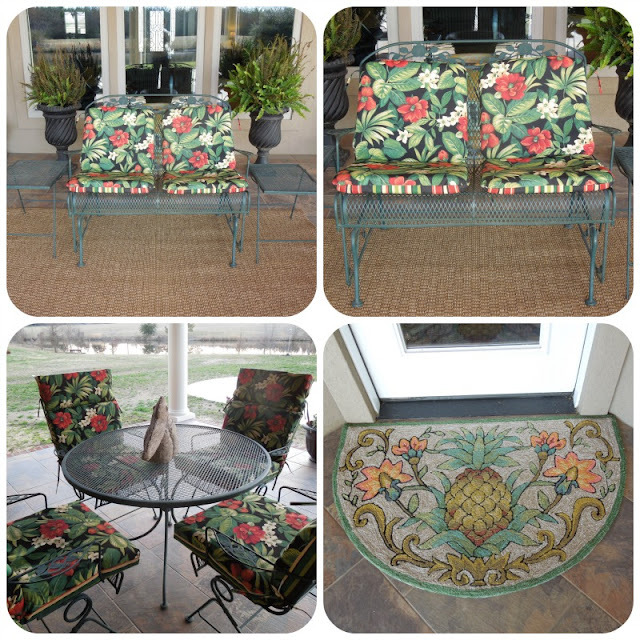 Now, we will have a nice place to enjoy the early mornings or the late afternoons once Spring arrives. Now, the work will soon begin on the patio and the yard. Little by little it will all come together and be something that we can enjoy for the years to come. 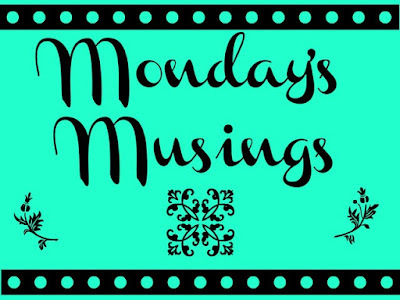 Today's favorites will be items/things that I really like/love and think you might too. And, I sleep on this baby every night of my life and have for the past 8 years. 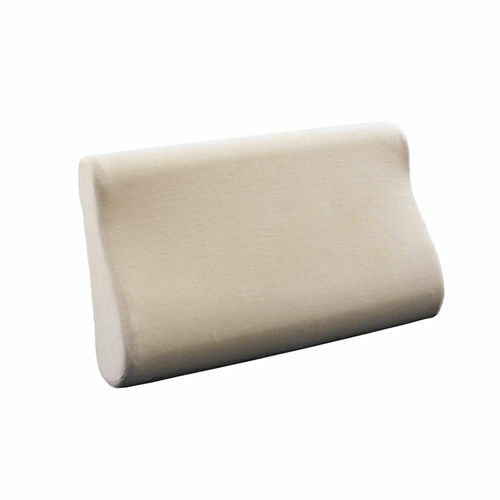 It is a super fine contour pillow that keeps your neck and back aligned. When my Chiropractor suggested this I was not sure how something shaped like this was going to feel. But, it is the "cat's meow" as they say. I have only had 2 in 8 years and they have both been from Brookstone. They are $99 and worth every cent. You can find them much less expensive but just remember, you get what you pay for generally. I don't think $99 is that bad for something that you get 4 years of use out of and it keeps your neck in good working order. I found out about this wonderful sweetner a couple of years ago and it is all I use in my coffee now. I was using one of the brands that has Aspartame and I knew I had to get away from that scary ingredient. This is all natural and has such a good taste. I do find that I have to use 3 packages per cup of coffee instead of 2 that I was using with the other brand. It comes in bags to use in baking and such but I have no experience with that. I use the "real thing" in my baking but I should try this and see how it works sometime. Okay, there you have it, my favorites for this week. Women need to always keep each other well informed of their favorite items as they just might become another women's favorite as well. It's called "sticking together." 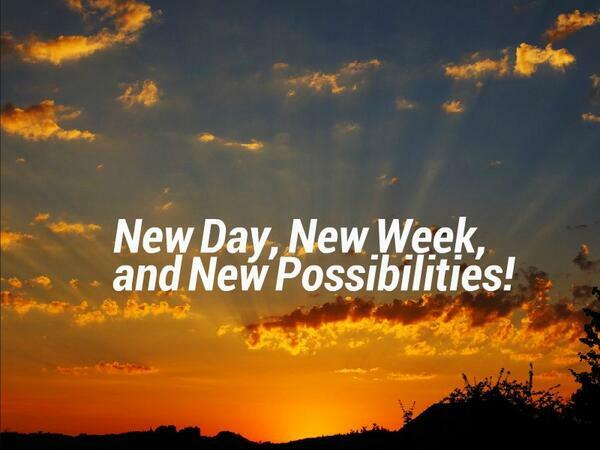 Now, go and have yourself an awesome weekend! 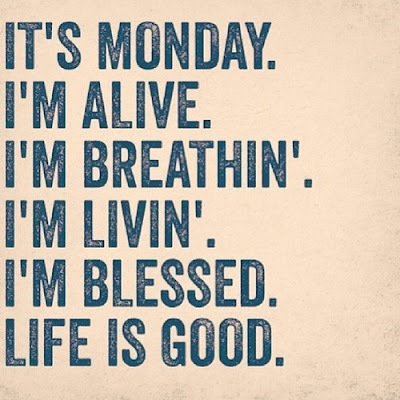 I missed posting last Monday as Hubby and I were in route home from Oklahoma where we had been to see our daughter and her family. We were so surprised at how Coleman had changed since Thanksgiving. He's so responsive, laughs and is such a happy little fella. 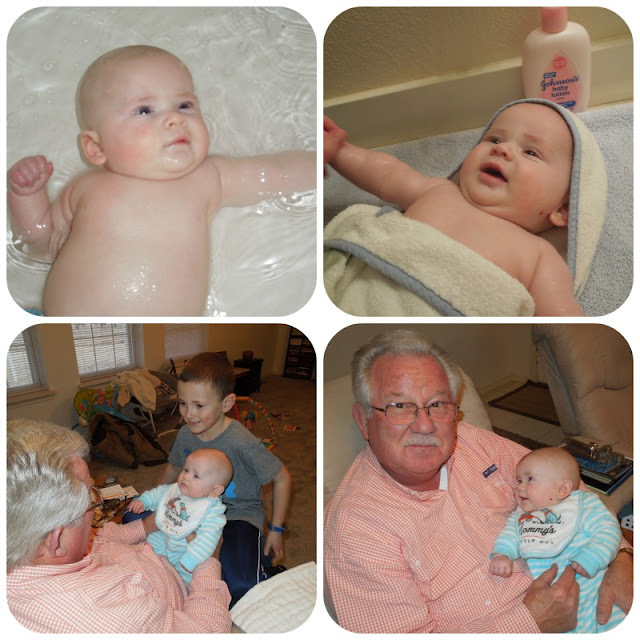 I love the way he is looking at his Poppa in the above pictures. And, there's not much sweeter than a baby straight out of the bath tub. 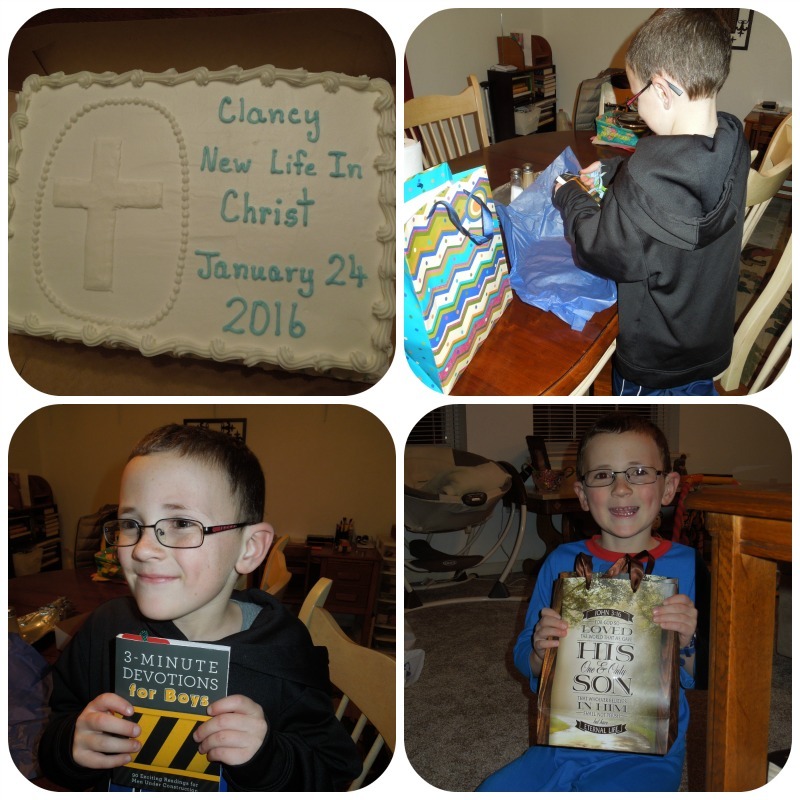 Our main reason for going last weekend was to attend Clancy's baptism on Sunday morning. We had a little celebration with a cake and some gifts to commemorate this most special time in his life. Clancy was beside himself with excitement on Sunday morning as we were getting ready to go to church. 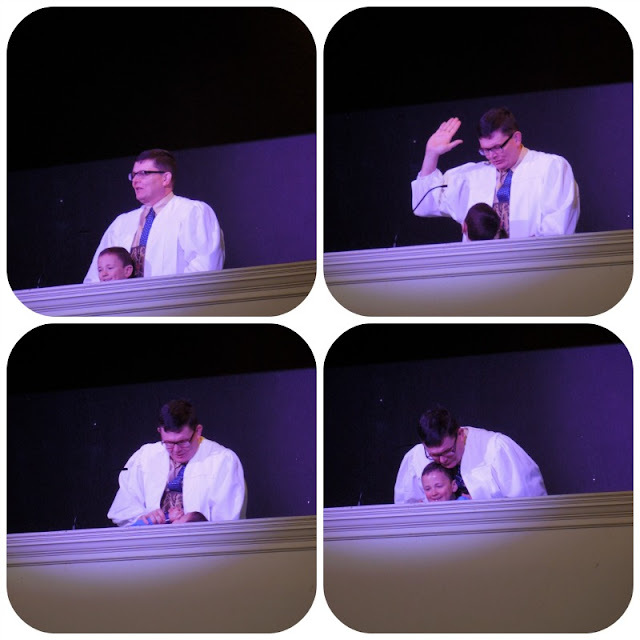 The pastor told us after church that he wasn't sure who was going to baptize who when they got in the baptistry because of Clancy's excitement. ~so cute~ It was definitely worth the 8 hour drive to attend this special event. Last Thursday evening I had the privilege of hosting my small group from our SS Class. We have a rather large class and we felt like to better minister to the needs of the class that it would be good to have small groups within the class. So, we started this at the beginning of this church year last Sept. I believe we have 4 groups with about 8-9 in each group. Each group tries to meet every quarter and we will rotate groups at the end of the church year. Since it is near Valentine's Day and I happen to love Valentine's Day I decided to make each lady in my group a chocolate fudge heart. I packaged them in a red box with pink ribbon and I made a cute sticker to finish it off. 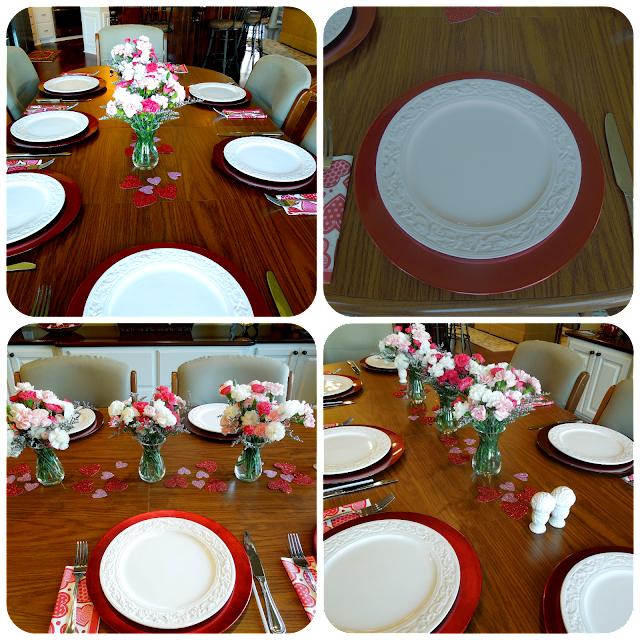 I carried the Valentine theme over to the table scape. Now, I'm no flower arranger but I did the best I could and I thought they turned out real cute. And, the white plates on the red chargers added a real "pop". The menu for the evening was cheesy chicken spaghetti, cole slaw, french bread and a Lemon Blueberry Poke Cake. If you want the recipe for this cake click here. I mean, what's not to like about a mixture of lemon and blueberry. It was an evening of sweet fellowship and getting to know one another on another level. Most of us just see each other at SS and there is limited fellowship so this gives us that time outside of SS. 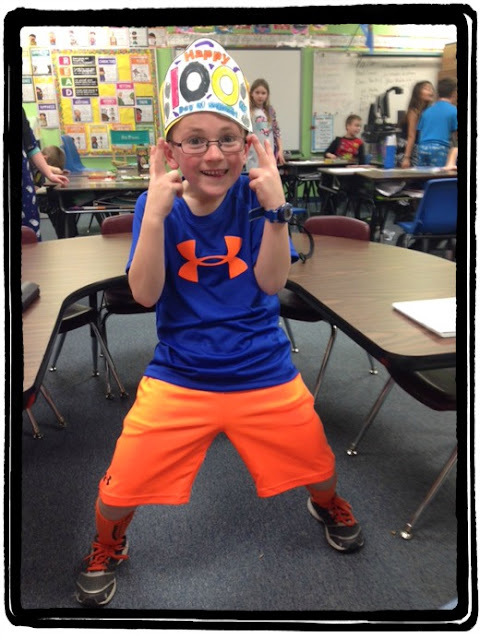 Clancy had his 100th day of school this past Friday and was a wee bit excited. This child can make normal everyday happenings explode with excitement. He's such a fun child! I came home with the beginnings of a cold bug and that bug had hit me pretty hard by Thursday. But, since I had committed to hosting the gathering here I trudged forth and made it through. I knew after the gathering that I was sinking fast and would more than likely need to see my Dr. on Friday and that I did. It's just a nasty head cold but it knocked me down for sure. My throat was so sore from drainage and my head was so congested. But, he gave me a couple of meds and by Sat. I was definitely better and am continuing to feel more human everyday. I do not know when I have been sick. I am so blessed with good health and this little episode just reminded me, once again, how thankful I am for my good health.